This week I got to catch up with our user Shawn Carbonell and his biotech company OncoSynergy, who has made exciting progress in the 2 months since we last talked. They were honored with the Children’s Humanitarian Award from the Children’s Tumor Foundation at their annual Gala in New York City and have just announced they are the Social Media Sponsor of the 2014 Race for Hope for brain cancer research held in conjunction with Accelerate Brain Cancer Cure (ABC2) and the National Brain Tumor Society. However, perhaps most importantly, Shawn Carbonell’s wife, Anne-Marie Carbonell, has joined the OncoSynergy team as Vice President of Clinical Development. There are so many fascinating elements to Anne-Marie. Both Shawn and Anne-Marie successfully matched into neurosurgery residency only to find new career tracks; they’re now making the fight against brain cancer the family business. That’s only a small fraction of the incredible story, read the rest below! Q: Tell me about yourself, how’d you get into neurosurgery? Anne-Marie: I decided I wanted to be a neurosurgeon when I was only 18 years old. I think it was surprising to people who didn’t know me well, since I was better known for my signature pink lipstick and fashion expertise. I had the right undergrad major, biochemistry, but otherwise had no medical connections so I decided to cold call a neurosurgeon for advice. He suggested I start by shadowing his residents on rounds at 4:30 am. I didn’t flinch. I showed up bright and early every day until I gained his respect. He became my first mentor. A few years later my whole life was turned upside down when I went from doctor to patient. A few surgeries and pacemakers later, I realized I could no longer return to the career I had been working towards for the last decade. 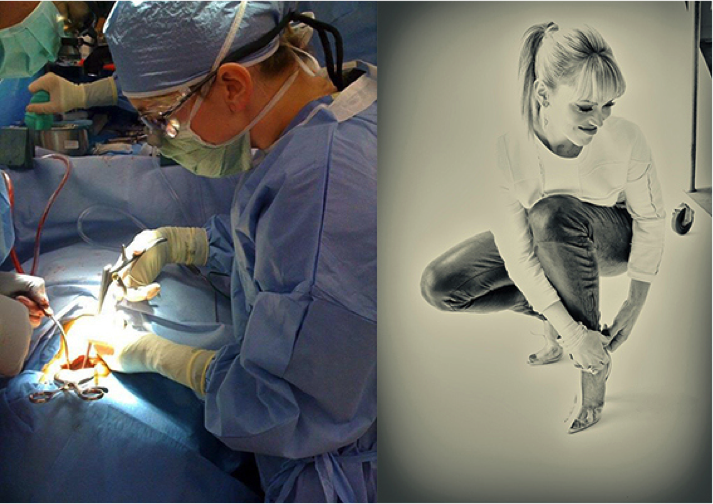 I was scared, I didn’t know how or want to be anything but a surgeon. Q: How did you find your career in clinical development? Anne-Marie: It was a rough transition. I went from being this extremely confident and accomplished physician working a hundred hours a week, to not being able to shower on my own. I thought my life was over, I was at an all time low. It took me a year of recovery to figure out my next move. Colleagues encouraged me to switch to a less demanding medical field like dermatology or radiology. It made sense so I had meetings and interviews, but in the end I couldn’t step away from my field, neurosurgery. Maybe I couldn’t treat these patients anymore, but there had to be something I could still do to help them. So I tried industry. My first job was as the spine marketing manager for a medical device company. It was a great introduction to medicine as a business. I learned all about reimbursement, forecasting, and business plans but the “clinical side” of my brain felt like it was atrophying. A year later I was lucky enough to be offered a position in clinical research at another device company. I learned how to design protocols, taught cerebrovascular anatomy and physiology, trained investigators, and oversaw study safety committees. It was more challenging and I started to feel a little bit like my old self again. I was involved in all the aspects of planning and executing large clinical trials – it was a great learning opportunity and the perfect stepping stone to my role at OncoSynergy. Q: How did Shawn convince you to join OncoSynergy? Shawn: …over hot wings at the local brewery! Anne-Marie: When Shawn formally asked me to work for OncoSynergy I was shocked and scared. I was scared because I knew I would say yes. In saying yes, I was giving up a stable big corporate job to join a young startup whose founder and CEO was my husband. But what Shawn was offering was more than a job. As corny as it may sound, it was an opportunity to have a mission in life again, to make a difference for those people who once were my patients. Q: How has it been transitioning to OncoSynergy? Anne-Marie: It has been great to be a part of this company. I am so impressed with our small team and what we are able to accomplish in such a short time. In terms of Shawn and I, it has actually been great working together. We love what we do and it has probably strengthened our relationship if anything. Before I was actually jealous of his passion for the company and the cause. Not because I wanted his attention, but because I wanted to feel like that about something again. Someone who knows me well recently told me I was “saved by this job.” I think it’s true. Q: What’s happening at OncoSynergy right now and what are you working on? Anne-Marie: We have three drug platforms under development for the treatment of various cancers and neurofibromatosis. My job is to plan the clinical and regulatory strategy that will get these therapies to the patients as quickly and safely as possible. Our lead drug is OS2966, a first-in-class antibody with multiple mechanisms of action including overcoming therapy resistance. I am planning the initial Phase I trials in glioblastoma, the most common and malignant primary brain tumor. From a business perspective, this drug is extremely exciting for OncoSynergy because it has blockbuster potential, but even more important from my perspective as a physician this drug could be a game changer for patients with glioblastoma. Shawn: With this goal in mind, we are particularly excited to be joining forces with the Accelerate Brain Cancer Cure (ABC2) organization and the 17th Annual Race for Hope to support brain cancer research. The event will be held on May 4, 2014 in Washington, D.C. and is the world’s largest brain tumor community event. The race was co-founded by ABC2’s Nike Beddow who lost her sister to glioblastoma. Q: What kind of opportunities is ABC2 enabling? Anne-Marie: ABC2 is a venture philanthropy organization that partners with entrepreneurs, industry, scientists, and clinicians to find a cure for brain cancer. Shawn: They are unusual in that they are willing to make some fairly risky bets in order to really nurture tomorrow’s transformative new therapies. I like that because it seems these days that a lot of entities in biomedicine play it safe, cling to dogma, and operate largely to justify their own existence. In contrast, we met with ABC2’s CEO, Max Wallace, recently and he put it bluntly – their goal is to “put themselves out of business.” That is awesome. Anne-Marie: We are excited to work with them to reach that goal quickly as possible. Q: What does the Race for Hope mean to you? Anne-Marie: When you’re working at a biotech startup, you put in crazy hours just to keep the doors open – it’s easy to lose focus. The Race for Hope renews our sense of mission. For Shawn and I, this is extremely important because we were both in neurosurgery and saw patients suffering and dying of this disease. Shawn: The race is held in May which is Brain Tumor Awareness Month. OncoSynergy was incorporated in May of 2011; this was not a coincidence. But we are not just sponsoring the event as a company. As Anne-Marie alluded, this is very personal for us as well and we are both participating by raising donations and running the race together. You can donate to Shawn and Anne-Marie’s Race for Hope campaign here.